Verizon IndyCar Series star James Hinchcliffe has been tapped by Honda USA in a series of new TV spots to help launch their "Honda Dream Garage Spring Event" sales campaign. Starting this week, the ads will feature the Schmidt Peterson Motorsports driver as he showcases a multitude of "dream" deals to be had on Honda's line-up of vehicles, powersports and marine equipment. Hinchcliffe will star in five different spots focusing on CR-V, HR-V, Clarity PHEV, Pilot and Civic models. The ads will air across national television, radio and online/social media platforms. 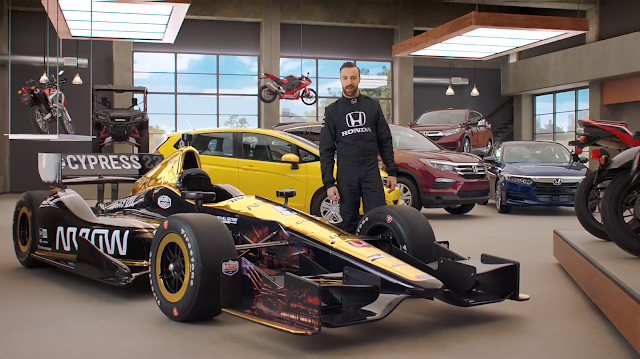 This is the first time that Honda has used an IndyCar driver to act as a national spokesperson.